Miracle. Fantasy. Pie in the sky? Images of the LG Miracle have surfaced along with a possible retail name for the phone, the Fantasy E740. The photos appeared on a Romanian trading site and were quickly removed but not before a GSM Arena tipster was able to save them. 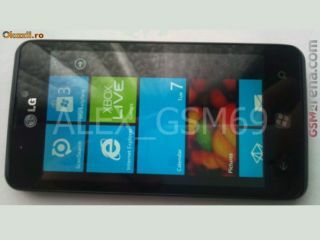 The handset in the pictures is a working unit running Windows Phone 7.5 and clearly has "Not for Sale" on the back – suggesting this is a prototype and not the finished product. Specs and a render of the proposed LG Miracle were already in the wild before these images appeared on the scene. The Miracle/Fantasy is expected to come with a 1GHz processor, 4-inch WVGA NOVA display, rear facing 5MP camera capable of capturing 720p video and a front facing VGA snapper. NFC (near-field communication) looks set to feature in the Miracle, but isn't currently supported by version 7.5 of the Windows Phone OS. This may well tee us up for a joint MWC 2012 launch of the LG Miracle and Microsoft confirming support for NFC on Windows Phone.